Cave fish. It’s hard to imagine a less-assuming creature – pigmentless, eyeless, and only a few inches long. And yet, these little creatures hold a bunch of secrets that scientists just keep unraveling. Among the interesting traits discovered in various cave fish species is their ability to “tell time” without regulation from sunlight; the fact that they can produce offspring with sight in a single generation; that they nap instead of sleep, and that, even after a million years of evolution in complete darkness, they can still detect light. Evolution maintains that as more time passes, living things evolve to acquire better and more useful traits. As such, shouldn’t the loss of a useful trait, such as eyesight, be regarded as the opposite of evolution? Yes, I know. A first year biology student could answer that, but let’s move on. Knowing of the eyeless cave fish’s position as the darling of creationist conjuring, you can imagine my glee to see the little guys back in the science news in a study that scores a trifecta for evolution. Yes, it has everything – phylogenetics, the fossil record, and plate tectonics—all wrapped up neatly in 100 million years of geological and biological history. Last week a team of researchers from Louisiana State University and the American Museum of Natural History announced that two types of cave fish, separated by 7000 km of ocean, are each other’s closest relatives. Their paper is published in PLOS ONE (full text avail). “This is the first time that a taxonomically robust study has shown that blind cave vertebrates on either side of an ocean are each other’s closest relatives,” said Prosanta Chakrabarty, an assistant professor and curator of fishes at Louisiana State University’s Museum of Natural Science. The fish in question are cave-dwelling gobies. One group is from the genus Typhleotris, which are endemic to southwestern Madagascar. The other hails from northwestern Australia and is a member of the genus Milyeringa. Now before you think, “Well that makes sense. They’re fish. They probably swam across the ocean,” know this: Besides being blind, these fish are obligate cave-dwellers (troglobites) –that is, they cannot survive outside of the specialized environment of their limestone caves, which, by the way, are landlocked. In fact, whether fish, insect, or crustacean, there are almost no creatures worse-equipped to disperse across great distances than troglobites. For many of these animals, everything outside their cave – the chemical make-up of the air or water, the temperature, the UV light, the predators, the diseases — would be so alien that leaving the cave would be like landing on Mars. So how did these sister fish end up at opposite ends of the Indian Ocean? The timing of their genetic split provides a clue. Comprehensive mitochondrial DNA analysis of the two groups, calibrated with the fossil record of teleost fish, shows that they are linked through a common ancestor that existed around 100 million years ago. Evolutionary relationships and divergence times of Gobiiformes. The blue dot marked B shows the estimated point of divergence between the groups Typhleotris and Milyeringa. Following the vertical line down from there you can see that it falls during the Late Cretaceous, a time that coincides with the fragmentation of Eastern Gondwana that took place throughout the Early and Late Cretaceous. 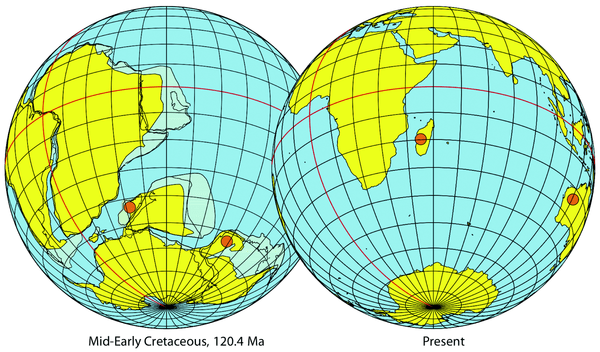 In other words, the common ancestor of a group that includes Typhleotris and Milyeringa probably lived in caves throughout Eastern Gondwana during the Early Cretaceous (146 – 100 Million years ago). As the ancient continent split, some caves went one way and some went another, taking their ancestor fish with them. After the split, some fish ended up on the Australian continent; others in Madagascar. Now separate and living in different cave environments, the two populations slowly evolved into their own distinct species. Interestingly, with only one exception, every freshwater fish group in Madagascar has relatives in India, Sri Lanka or Australia – relationship patterns that coincide with the breakup of Gondwana. So this begs a question: Was the ancestor (Fish B) eyeless or did that trait develop independently in the two separate groups? The loss or reduction of eyes occurs in less than 1% of all known species (150 of 28,000) of fish and all of these occur in a mere 20 families, so that means that independent loss of eyes is an immensely rare event among fish. Given that, and the fact that adult and larval Milyeringa are eyeless and adult and juvenile Typhleotris are eyeless (no larva have been observed), there is a high likelihood that the common ancestor that gave rise to those groups was, itself, blind. Not only that, but it was probably the group in which eyelessness developed. Going back to the above chart, notice Fish A. This is the common ancestor that gave rise to the ancestor of Typhleotris and Milyeringa, and to another group, Eleotridae. Eleotridae includes a wide variety of predominately Indo-Pacific “sleeper gobies” that inhabit freshwater, saltwater, and brackish systems. All but one of the approximately 150 Eleotridae species has functional eyes. This indicates that it is likely that Fish A had functional eyes and the trait was lost in Fish B. On the chart, the blue circles indicate fish are (or were likely) to lack functional eyes. Green circles indicate fish with functional eyes. 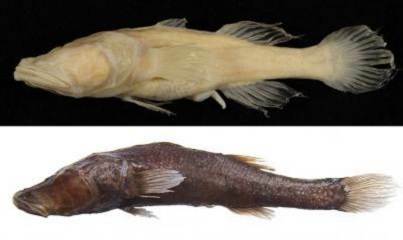 This composite image shows Typhleotris pauliani (top), a previously known species of Malagasy cave fish, and the newly discovered pigmented species (bottom). Finally, the research team had another exciting announcement. Included in their pool of Madagascar cave fish was a brand new species. This unusual member of Typhleotris is blind, but pigmented – a surprise since it descended from a non-pigmented ancestor. There will be more information (and a name) for this new species in a future paper. Composite map I created from chart images and Google Maps. PreviousFriday Fiction Facts: Ladies & Gents, The 4th Dimension! I’ve seen the ‘living fossil’ – the coelacanth – and still enjoy exploring the fossils, the various specialised life forms one sees all around one. No, the ‘Creationists’ do not represent mainstream Christian teaching anywhere except in the US. Really? The whole self contradicting and completely out of order bit doesn’t give you pause? How odd. Could that Ancestor B actually have been a surface dwelling freshwater fish, with independent loss of eyes? I have trouble seeing how cave fish could spread hundreds of miles across above-ground river systems. As to eyes being lost rarely, I wouldn’t look at all fish species but only cave-obligate species to see how rare it is, and use that to determine how likely it is to have happened independently. Is one of the red dots in the “before” continental drift map misplaced? It looks like one of the dots is on the future Indian subcontinent instead of Australia, and the correct placement would actually show the two locations much closer together. Well, since scholars know that Genesis was a conflation of the J/E/P sources, and Sumerian creation myths, and none of them could possibly have known what went on before, (in your book), h Sapiens was created, you have one hell of a lot bigger problem than the word “era”, sir.